خوجم‌لی, الله‌یار, دولتی ارده‌جانی, فرامرز, مرادزاده, علی, نجاتی کلاته, علی, پرخیال, سهیل, رحمانی, محمد رضا. (777). تحلیل­ طیفی داده­های مغناطیس هوایی به‌منظور اکتشاف ظرفیت­های زمین‌گرمایی استان آذربایجان شرقی. 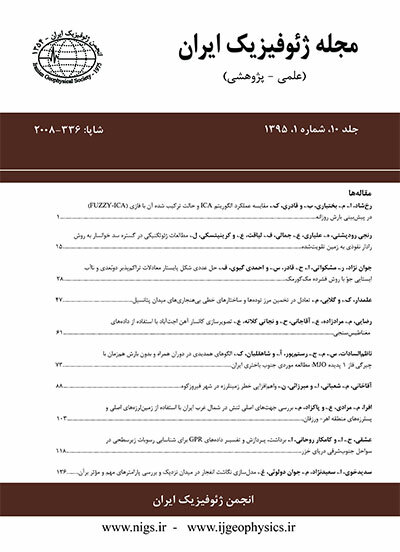 مجله ژئوفیزیک ایران, 9(4), 94-103. الله‌یار خوجم‌لی; فرامرز دولتی ارده‌جانی; علی مرادزاده; علی نجاتی کلاته; سهیل پرخیال; محمد رضا رحمانی. "تحلیل­ طیفی داده­های مغناطیس هوایی به‌منظور اکتشاف ظرفیت­های زمین‌گرمایی استان آذربایجان شرقی". مجله ژئوفیزیک ایران, 9, 4, 777, 94-103. خوجم‌لی, الله‌یار, دولتی ارده‌جانی, فرامرز, مرادزاده, علی, نجاتی کلاته, علی, پرخیال, سهیل, رحمانی, محمد رضا. (777). 'تحلیل­ طیفی داده­های مغناطیس هوایی به‌منظور اکتشاف ظرفیت­های زمین‌گرمایی استان آذربایجان شرقی', مجله ژئوفیزیک ایران, 9(4), pp. 94-103. خوجم‌لی, الله‌یار, دولتی ارده‌جانی, فرامرز, مرادزاده, علی, نجاتی کلاته, علی, پرخیال, سهیل, رحمانی, محمد رضا. تحلیل­ طیفی داده­های مغناطیس هوایی به‌منظور اکتشاف ظرفیت­های زمین‌گرمایی استان آذربایجان شرقی. مجله ژئوفیزیک ایران, 777; 9(4): 94-103. نقطة کوری، دمایی است که در آن سنگ‌های پوستة زمین خاصیت مغناطیسی خود را از دست می‌دهند. در مناطقی که طرفیت زمین‌گرمایی دارند و یا مناطق آتشفشانی جوان انتظار می‌رود که عمق نقطة کوری به‌طور قابل‌توجهی کم باشد. ارزیابی تغییرات نقطة کوری یک منطقه می‌تواند اطلاعات با ارزشی از توزیع دمایی ناحیه‌ای در عمق و تمرکز انرژی زمین‌گرمایی در زیر سطح عرضه کند. ایدة به‌کارگیری داده‌های مغناطیس هوایی برای برآورد عمق نقطة کوری خیلی جدید نیست و تاکنون در جاهای گوناگون دنیا در نواحی فعال زمین‌ساختی و ژئودینامیکی از آن استفاده شده است. در این تحقیق از داده‌های مغناطیس هوایی استان آذربایجان شرقی برای برآورد عمق کوری استفاده شده است. برای این کار، ابتدا نقشه تبدیل میدان به قطب تهیه شد. سپس ابعاد بهینة بلوک انتخاب شد و بلوک‌بندی روی نقشه تبدیل میدان به قطب صورت گرفت. عمق بالایی عمیق‌ترین بلوک مغناطیسی با برازش خط راست به دومین بخش بلندترین طول موج طیف توان شعاعی به‌دست آمد. همچنین عمق مرکزی عمیق‌ترین بلوک مغناطیسی با برازش خط راست به بخش بلندترین طول موج طیف توان شعاعی برآورد شد. با توجه به عمق بالایی و مرکزی بلوک‌ها، عمق نقطة کوری برای هر بلوک محاسبه شد. عمق کوری برآوردی برای منطقة مورد بررسی بین 42/9 تا 92/18 کیلومتر تغییر می‌کند. در مناطقی که تمرکز چشمه‌های آب‌ِگرم بیشتر است، عمق نقطة کوری به‌طور قابل‌توجهی کمتر از بقیه مناطق است و این نواحی را می‌توان درحکم نواحی امیدبخش برای اکتشاف منابع زمین‌گرمایی محسوب کرد. The Curie point (approximately 580C for magnetite at atmosphere pressure) is the temperature at which spontaneous magnetization vanishes and magnetic minerals exhibit paramagnetic susceptibility. The depth at which temperature reaches the Curie point, is assumed to be the bottom of the magnetized bodies in the crust. Curie point temperature varies from region to region depending on the geology of the region and mineralogical content of the rocks. Therefore, one can normally expect shallow Curie Point Depths (CPD) at regions which have geothermal potential, young volcanism and thinned crust (Aydin and Oksum, 2010). The assessment of the variations of the Curie depth of an area can provide valuable information about the regional temperature distribution at depth and the concentration of subsurface geothermal energy (Tselentis, 1991). Â Â Â There are two basic methods which have been used in the examination of the spectral properties of magnetic data to estimate the magnetic basement depth. The first is the method of Spector and Grant (1970) and the second is the method of Bhattacharyya and Leu (1975, 1977). Spector and Grant (1970) showed that the expectation value of the spectrum of an ensemble model was the same as the average depth to the top of an ensemble of the magnetized rectangular prism. The second method estimates the depth to the centroid of the body by using the interpretation of a single anomaly. This method is useful when no spectral peaks occur on the amplitude spectra (Li et al., 2010). Following this, a joint method was developed by Okubo et al. (1985) who combined and expanded the ideas of the methods to the purposes of geothermal exploration. Â Â Â CPD estimation (Zb) is obtained in two steps as suggested by Okubo et al. (1985). First, the centroid depth (Z0) of the deepest magnetic source is estimated from the slope of the longest wavelength part of the spectrum divided by the wavenumber, where P(k) is the power density spectrum, k is the wavenumber, and A is a constant. Second, the average depth to the top boundary (Zt) of that distribution is estimated from the slope of the second longest wavelength spectral segment (Okubo et al., 1985),Â where B is a constant. The equation Zb = 2Z0 - Zt(Okubo et al., 1985) is used to estimate the depth to the bottom (Zb) of the inferred CPD from the centroid (Z0) and the top depth (Zt) estimated from the magnetic source for each sub-region. Â Â Â The study area was divided into eleven overlapped blocks for the purpose of spectral analysis. Center of blocks are shown on the residual field map (Figure 3). Each block covers a square area of 140 km by 140 km. Power spectral analysis was conducted on the RTP values of each of the blocks by plotting the logarithm of spectral energies against the wavenumber. The CPD estimation procedure as suggested by Okubo et al. (1985) was carried out for the eleven blocks to obtain the Curie point depth for each block. Figure 5 shows Curie depth values and thermal springs of the study area. In this figure, Curie depth varies between 9.42 and 18.92 km. For the blocks of 3, 6 and 7, Curie point depth is significantly less than the other blocks, which could be due to the presence of high temperature hot springs in this area. According to the geological information and Curie point depth values, A, B, C and D area are recommended for more geothermal investigation. Aydin, I. and Oksum, E., 2010, Exponential approach to estimate the Curie-temperature depth, J. Geophys. Eng, 7, 113-125. Bansal, A.R., Gabriel, G., Dimri, V.P., and Krawczyk, C.M., 2011, Estimation of depth to the bottom of magnetic sources by a modified centroid method for fractal distribution of sources: An application to aeromagnetic data in Germany, Geophysics, 76, NO. 3, 11-22. Bhattacharyya, B.K., and Leu, L.K., 1975, Analysis of Magnetic Anomalies Over Yellowstone National Park: Mapping of Curie point Isothermal Surface for Geothermal Reconnaissance, J. Geophys. Res., 80, 4461-4465. Bhattacharyya, B.K., and Leu, L.K., 1977, Spectral analysis of gravity and magnetic anomalies due to rectangular prismatic bodies, Geophysics, 41, 41–50. Bhattacharyya, B.K., and Morley, L.W., 1965, The Delineation of Deep Crustal Magnetic Bodies from Total Field Aeromagnetic Anomalies, J. Geomagn. Geoelect, 17, 237-252. Blakely, R., 1988, Curie temperature isotherm analysis and tectonic implications of aeromagnetic data from Nevada, J. Geophys. Res., 93, 11817–11832. Blakely, R.J., 1995, Potential theory in gravity and magnetic applications, Cambridge Univ. Press, Cambridge. Bouligand, C., Jonathan, M., Glen, G., and Blakely, J.R., 2009, Mapping Curie temperature depth in the western United States with a fractal model for crustal magnetization, J. Geophys. Res., 114, 1-25. Byerly, P.E., and Stolt, R.H., 1977, An Attempt to Define the Curie Point Isotherm in Northern and Central Arizona, Geophysics, 42, 1394-1400. Gupta, H. and Roy, S., 2007. Geothermal Energy: An Alternative Resource for the 21ST Century, Elsevier, 111pp. Hisarli, Z.M., Dolmaz, M.N., Okyar, M., Etiz, A., and Orbay, N., 2012, Investigation into regional thermal structure of the Thrace Region, NW Turkey, from aeromagnetic and borehole data, Stud. Geophys. Geod., 56, 269-291. Hochstein, M.P., and Sudarman, S., 2008, History of geothermal exploration in Indonesia from 1970 to 2000, Geothermics, 37, 220-266. Li, C.F., Shi, X., Zhou, Z., Li, J., Geng, J., and Chen, B., 2010, Depths to the magnetic layer bottom in the South China Sea area and their tectonic implications. Geophys. J. Int., 182, 1229−1247. Maus, S., and Dimri, V.P., 1995, Potential field power spectrum inversion for scaling geology, J. Geophys. Res., 100, 12605–12616. Mayalla, J.W.M., 2006, Geothermal mapping in the Hromundartindur area, SW-Iceland. The United Nations University, Geothermal Training Program, Iceland, Reports 2006, No: 13, 245-260. Okubo, Y., Graf, R.J., Hansent, R.O., Ogawa, K., and Tsu, H., 1985, Curie point depths of the island of Kyushu and surrounding areas Japan, Geophysics, 53, 481-494. Pilkington, M., and Todoeschuck, J.P., 1993, Fractal magnetization of continental crust, Geophys. Res. Lett., 20, 627–630. Saleh, S., Salk, M., and Pamukcu, O., 2012, Estimating Curie Point Depth and Heat Flow Map for Northern Red Sea Rift of Egypt and Its Surroundings, from Aeromagnetic Data, Pure Appl. Geophys. Spector, A. and Grant, F.S., 1970, Statistical Models for Interpreting Aeromagnetic Data, Geophysics, 35, 293-302. Stampolidis, A., Kane, I., Tsokas, G.N., and Tsourlos, P., 2005, Curie point depths of Albania inferred from ground total field magnetic data, Survey Geophysics., 26, 461−480. Tanaka, A., Okubo,Y., and Matsubayashi, O., 1999, Curie point depth based on spectrum analysis of magnetic anomaly data in East and Southeast Asia, Tectonophysics, 306, 461–470. Trifonova, P., Zhelev, Z., Petrova, T., and Bojadgieva, K., 2009, Curie point depths of Bulgarian territory inferred from geomagnetic observations and its correlation with regional thermal structure and seismicity. Tectonophysics, 473, 362−374. Tselentis, G.A., 1991, An Attempt to Define Curie Depths in Greece from Aeromagnetic and Heat Flow Data, PAGEOPH, 136, 87-101.